APPLE & SULTANA, CHOCOLATE & FUDGE, CHOCOLATE & ORANGE (THE BEST ONE IMO), DOUBLE CHOCOLATE AND SUMMER FRUITS. IDEAL FOR IF YOU ARE ON A GREEN/RED DAY AND YOU HAVE YOUR HEB1 CEREAL IN THE MORNING AND DONT HAVE BREAD AT LUNCH OR FRUIT FOR BREAKFAST AND BREAD AT LUNCH AND THEN YOU HAVE A HEB2 LEFT OVER. 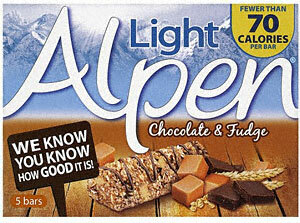 JUST MAKE SURE YOU PICK UP THE LIGHT VERSIONS OF ALPEN CEREAL BARS AND NOT STANDARD ALPEN CEREAL BARS.